A tree that has fallen victim to the state's tree mortality crisis. If anyone understands how to protect a home from wildfire, it’s the firefighters who work in and around the Sierra. So when retired volunteer firefighter Greg Staab set out to clear defensible space around his property, he took it seriously. Staab cleared the brush, pine needles and anything else that could fuel a fire near his home in Alta, Calif., but it wasn’t enough to satisfy his homeowners insurance company. On June 2, Staab received a notice that his insurance policy could not be renewed because his house is in an area prone to wildfire. Property owners in Placer County and neighboring communities are increasingly being denied homeowners insurance because of the growing risk of wildfire in the Western Sierra. Staab said he worries that if he loses his insurance, he’ll lose his house. He said his family can’t afford the high-priced alternatives to their current policy, and is concerned that even if he sold his house he wouldn’t be able to attract a buyer once they learned how difficult it is to maintain insurance. Staab’s notice of nonrenewal said that his property was no longer eligible for coverage because the fire risk hasn’t been mitigated by enough defensible space. “I’ve been with this company for the full 19 years I’ve been here, and nothing’s really changed except their attitude,” he said. He said he has cleared the amount of defensible space required by California law, had the property inspected and provided the company with photos, but there was one requirement he wasn’t able to meet: at least 10 feet of space between braches on trees. “I have two months left before my insurance runs out, and now with the tree mortality issue and the loggers in high demand, I’m going to have to be on a waiting list just to even get anyone out here,” he said. Most California counties staved off another drought this year, but the forests are in as bad of shape as ever. 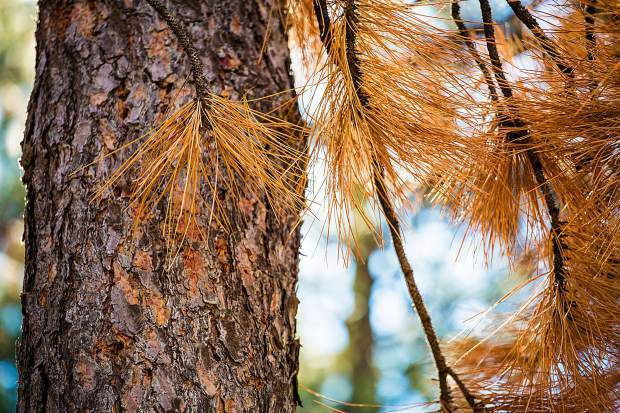 A U.S. Forest Service aerial survey put the total number of trees lost between 2010 and 2016 at about 102 million, and many of those are thought to be due to bark beetle infestation. While only 774,000 of those trees were in Placer County over the six-year period, 557,000 died in 2016 alone. 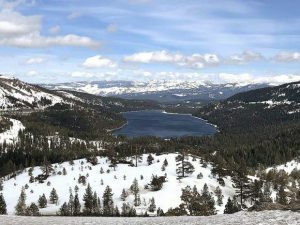 As the Sierra Sun recently reported, bark-beetle infestation continues to plague California’s forests despite the drought’s end because it takes more than one good winter to restore tree health — especially considering many of those trees fight for resources in what are already overcrowded forests. The beetles, which bore into trees to mate and lay eggs, find prime real estate in stands already weakened by drought and lack of nutrients. When they kill a tree, the wood not only becomes a fire hazard but it also needs to be wrapped in plastic and removed so that the beetles don’t spread to other trees. There isn’t much the county can do, he said, because the California Department of Insurance is the state agency tasked with regulating insurers and there’s no law mandating that insurance companies provide homeowners with insurance. “What’s happening is the insurance companies are looking at insuring in the wildland-urban interface area and saying ‘Wait a minute, we think our risk is too high,’ and they’re sending non-renewals on a mass scale,” he said. Many mortgage lenders require homeowners to have insurance, so losing that insurance ,and not being able to find a new provider can violate the loan agreement. If that happens, a lender can request the remainder of the loan payments in full. “If you have a mortgage and lose your insurance, that gives them the right in most cases to call in the note,” McEldowney said. The loss of homeowners insurance also presents a challenge to anyone who might be willing to sell his or her home, and move out of the wildfire risk area. “The major problem is that the wildfires have become so prevalent and so damaging that the number of claims, the cost to rebuild, is so high that the insurance companies themselves are having a hard time keeping up, so they have to raise their rates or pull out,” said Incline Village-based Allstate Insurance Agent David Hoopengardner, who works with customers in Nevada and California. He said that on the California side of the lake, the state Department of Insurance won’t allow insurers to raise their rates enough to keep up with all the claims, so they’re having to cancel policies in order to balance out their finances. He said that price for homeowner’s insurance is relatively low to the amount of money the company spends on claims. “It takes a lot to make sure the insurance companies don’t go bankrupt so they can continue to pay out their existing claims, so it’s a juggling act,” he said. But, things are slightly different on the Nevada side. For one thing, Hoopengardner said he doesn’t see as many nonrenewal notices as he used to see. “On the Nevada side, we’ve been dealing with this for so long that I’ve gotten to a point where if a homeowner is willing to do their defensible space, I can get a policy,” he said. Hoopengardner said insurance companies providing coverage in California do not currently accept those certificates, and it has to do with the state profile and the Department of Insurance. HOW MUCH IS ENOUGH DEFENSIBLE SPACE? Placer County District 5 Supervisor Jennifer Montgomery said the real heart of the issue lies in the fact that homeowners are trying to reach a certain bar when mitigating wildfire risk around their home, but they have no idea what that bar is for them. “Back in the day, we relied on Cal Fire’s 4291,” she said, referring to the state law that mandates all structures in the wildfire risk zone have 100 feet of defensible space cleared about the building to prevent it from burning. Because of the lack of standardized guidelines, fire districts can say one thing and insurance companies can require something completely different. 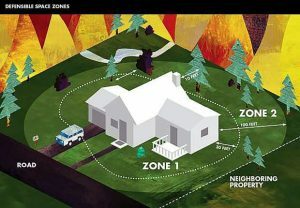 One hundred feet of defensible space may satisfy state law, but an insurance company can ask for 1,000 feet, even when homeowner’s property line doesn’t extend that far. “Some companies recognize fire-wise communities, and others don’t at all,” she said. Assessing how likely a wildfire is to occur is complicated task, and not everyone doing it considers the same combination of factors, Montgomery said. Some companies don’t take mitigation efforts into consideration at all. She said that even at the state capital building, most of the trees there would need to be removed to meet that requirement. Montgomery said that she and McEldowney have been working together for years to try and encourage the state Department of Insurance to prioritize the issue. “One of the real frustrations for homeowners, particularly those on fixed income, is there aren’t any monetary options to help people out,” she said. McEldowney said that since the county doesn’t have the authority to mandate anything for the insurance companies, he’s hoping that bringing more attention to the matter will encourage some discussions about how to fix the problem. “The county is trying to help where we can and when we can, but on the insurance piece specifically the only thing we can do is try to advocate,” he said. Montgomery and McEldowney are asking residents who receive nonrenewal notices to contact the California Department of Insurance. You can call them at 1-800-927-4357, or visit their website at insurance.ca.gov to send them an email.